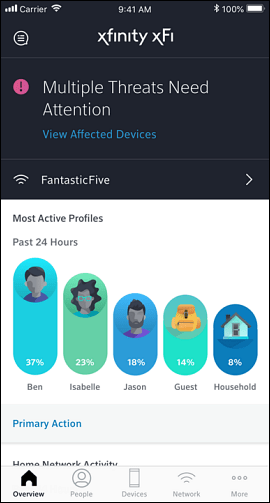 Comcast internet customers have a new add-on option – xFi Advanced Security, an “artificial intelligence” security package designed to identify and block Wi-Fi intrusions and hack attacks on Internet of Things (IoT) equipment like lights, thermostats, smart meter apps, Wi-Fi equipped home appliances, security cameras, doorbells, voice enabled personal assistants, and garage door openers. Comcast will sell the package for $5.99 a month (except for xFi Advantage customers, who get Advanced Security included at no additional cost), based on claims that hacker attacks on IoT devices are up 600% from 2016-2017.
xFi Advanced Security provides an added layer of protection for your entire network by preventing you from inadvertently accessing malicious sites, blocking remote access to smart devices from unknown or dangerous sources and monitoring activity in real time to detect when devices are behaving in unusual ways that could indicate a network threat. Whenever a threat is detected, it’s automatically blocked and you are notified in xFi and given tips on how to resolve.